Use the form below to inquire about Forest Resort near Shervarayan Hill . Use the form below to reserve for Forest Resort near Shervarayan Hill . Four poster bed in a spacious room with ensuite bathroom. It has a separate sitting area with a sofa. Soak in old world romanticism at this iconic Forest Resort Near Shervarayan Hill, reminiscent of life in colonial times. Far away from the hustle and bustle of city life, jutting 4,700 ft above sea level lies the quiet hill station of Yercaud, famed for its natural beauty. Yercaud is known for its plantation estates, cozy English bungalows, pristine walkways, and placid lakes. Amidst all these, stands the Forest Resort Near Shervarayan Hill, on the banks of Yercaud Lake which is also home to a sprawling boathouse. This elegant resort is surrounded by a lush green coffee plantation which contributes to the tranquil atmosphere. 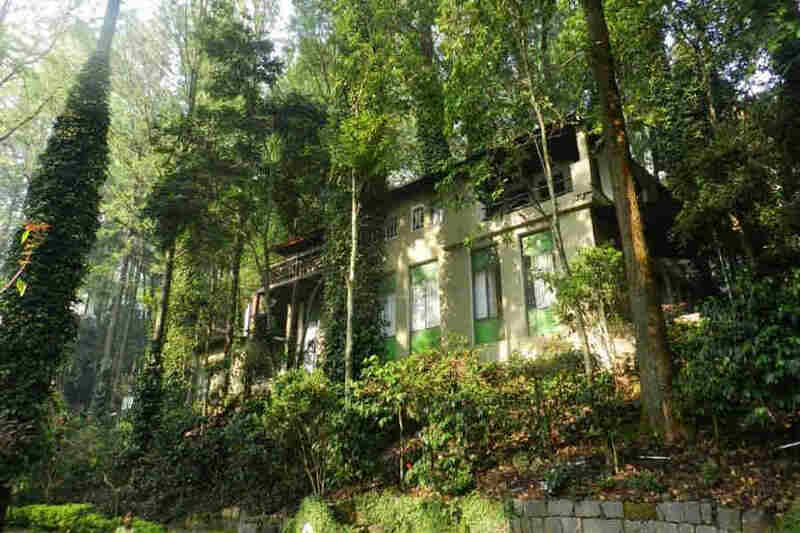 This Forest Resort Near Shervarayan Hill has a story to tell that dates back to the British heydays of the 19th century. The erstwhile residence of a British lady, this property has been carefully restored bit by bit in the regal Anglo-Indian architecture. This heritage hotel has been carefully curated with ample views of the lake and the forest while maintaining a delicate balance with nature. Promoting sustainability, the resort uses practices such as reusing condemned wood to protect the ecology, land, and heritage. It has also been recognized for its efforts by a renowned global publication. When it comes to food, the resort is known for its local Derai Cuisine, which features locally sourced ingredients of the highest quality. This resort houses a large collection of antique furniture with exquisite pieces like a ‘Scholar’s Desk’, kerosene fans, and English portable wardrobe being some of the highlights. The Forest Resort Near Shervarayan Hill is home to 75 luxury and royal suites which have been decorated tastefully with antique English furniture and artifacts. Exclusive family suites are also found here and no two rooms on the property are alike. The rooms have been named after famous English personalities. This is definitely one place where the past greets you with open arms, into its lap of luxury! Up to two children under the age of 10 can be accommodated in a room without an extra bed. 100% of the total package if cancelled 24hours prior to arrival. 50% of the total package if cancelled 3 days prior to arrival. 25% of the total package if cancelled 5 days prior to arrival. No retention if cancelled 1 week before arrival. Booking processing charges of 10.00% will be levied on all the refunds in addition to Cancellation Charges. While at this tranquil forest resort, you could lose track of time as you explore the verdant outdoors. From trekking or walking across the coffee plantation to boating on Yercaud Lake to a leisurely stroll through the town, you can do it all. If indoor games are what you want to do that is also possible at this heritage property. End the day with a warm bonfire under the starry night sky. If it's touristy things you want to do then Yercaud has plenty of it. Check out the Botanical Gardens and Anna Park if communing with nature tops your list. Choose from Lady’s Seat, Gent’s Seat, and Children’s Seat to enjoy spectacular views of the valley below. Shervarayan Temple is yet another spot to relish the scenic views as well as experience some divinity. The hilly terrain offers plenty of trekking opportunities all around while the lake has boating facilities if that is something you enjoy. And if you find yourself here sometime in May or June, then you might be able to catch the annual Summer Festival. Salem Airport is closest to Yercaud at 46 km while Tiruchirapalli Airport is 198 km away. Kempegowda International Airport, Bangalore, is at a distance of 249 km. Salem Junction is the nearest railway station at 32 km while Erode Junction is at 96 km. Bangalore City railway station is situated at a distance of 218 km. Salem is 38 km and Erode is 95 km away via SH 188 and NH544, respectively. Coimbatore is at a distance of 196 km via NH 544 while Bangalore is 215 km away along NH 44.